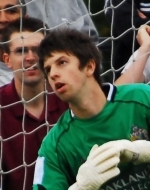 Teenage goalkeeper who has previously been on the books of Rushden & Diamonds and was a student of Paul Bastock’s goalkeeper coaching school in his hometown of Boston. Made his debut during the Saints Conference South match at Chelmsford City in September. Was with City on a dual registration with Spalding United but missed the final couple of games of the season after writing off his car on the morning of the Woking match.